That inner impulse that says, "oh, go ahead, it will turn out right" is usually wrong. The Rowan sweater had been pushed aside, in favor of Christmas knitting, for a couple of months. But it was calling me. So, midway through a really bad case of the flu, I pulled it out the week of Christmas and finished the fronts. Looks pretty good, if unblocked, doesn't it? There are actually two, major problems (I'm not going beyond the big 'uns). Problem #1, a little bit hard to see on the picture, is that I can't count. 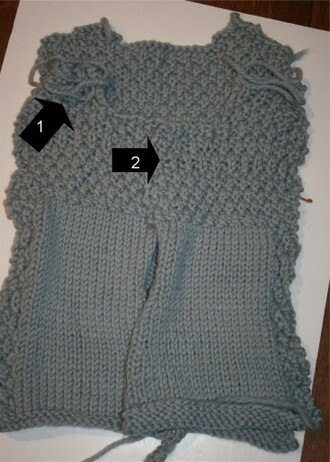 Apparently, when the pattern told me to stop on the fronts 8 rows before I stopped to do the neck shaping on the backs, I stopped about 8 rows too early. As knit, this sweater would likely be a good fit for a hunchback, or maybe not even then. I spent last night trying to convince myself it wasn't all that bad and that I could block the fronts into submission. But, there is also problem #2. Apparently, while doing the decrease rows, I stumbled out of pattern. There is a segment where I break out of Moss Stitch and into something, um, else. I spent last night trying to convince myself this was a charming pattern enhancement. 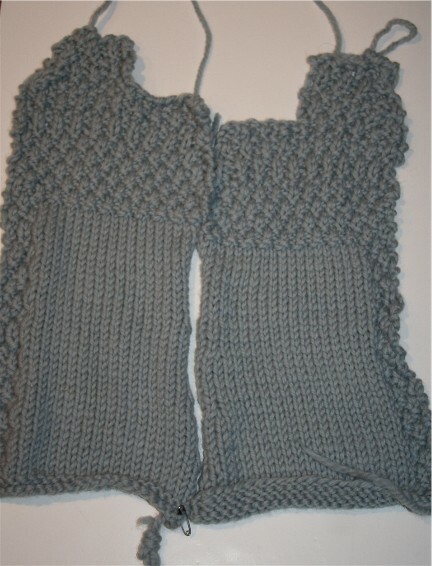 I really was going to give it a go, knit the sleeves, sew it up, go looking for a new friend with an oddly shaped back and maybe some thick coke bottle eyeglasses. But I can't, heaven help me. It's really awful. It's bad knitting and I'm going to have to rip it out, figure out where the heck the moss stitch pattern and the decreases went south, and make it right. I'm still in denial about the fact that despite the fact that I got gauge this looks a little bit small for me. That's what New Year's getting back into shape resolutions are all about, right? 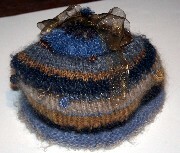 In less distressing news, I finished the blues & browns Be Sweet Tea Cozy. It's loveliness incarnate, but that is all about the yarn. This yarn is absolutely wonderful and I have enough stashed to do a sweater for me and a skirt for Ellie this year. 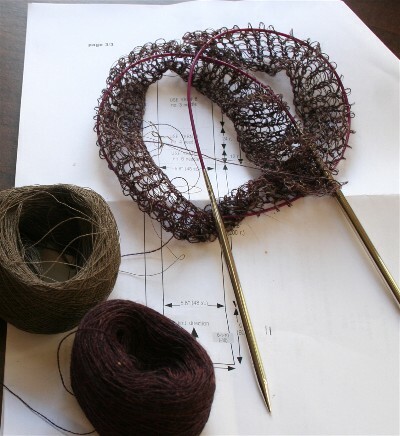 I've also made just a wee bit of progress on the Habu Kusha Kusha Scarf. Just a few more rows. 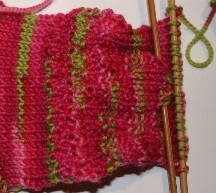 And, I've swatched for a pair of socks for myself in Shibui's beautiful Orchid colorway which is sort of a riot of Lily Pulitzer Pinks with a touch of green (not any red as it appears in the picture). I auditioned a couple of different stitches for the ribbing, but am still undecided. This yarn is so pretty that I think simplicity is going to be the key to these socks. I have a little bit of good to go with my bad. But I'm off to bed, going to get lots of sleep and a good headstart so I can figure out what's wrong with Anise tomorrow.